Today is overcasted by still hot and muggy. I went for my 5 mile walk and the was totally enjoying my self . I felt a drop of rain and I thought it was going to be just light showers. So I kept walking. Boy was I wrong. At the second drop I thought maybe I should turn around and start walking back to the house. 10 seconds later, (I kid you not) the sky opened up with torrential rains. Luckily where I was walking was near newly constructed homes and I ran to the first one with a porch. The construction guys were pouring foundation for the house next door. They looked a me and I am sure they thought I was definitely an out of towner. They just laugh, waved and continued to work. I had to wait for 30 minutes for the rain to stop. I started again but only got 1/2 a block and the rains came again. So I found another home that was not sold yet and stood on that porch for 15 minutes. I can see how this area could have flash floods. The rain here is no joke. There is gospel song that came to mind.It is called "The Storm is Passing Over". That is just how I felt. I finally made it back to Charlene's just a little wet. 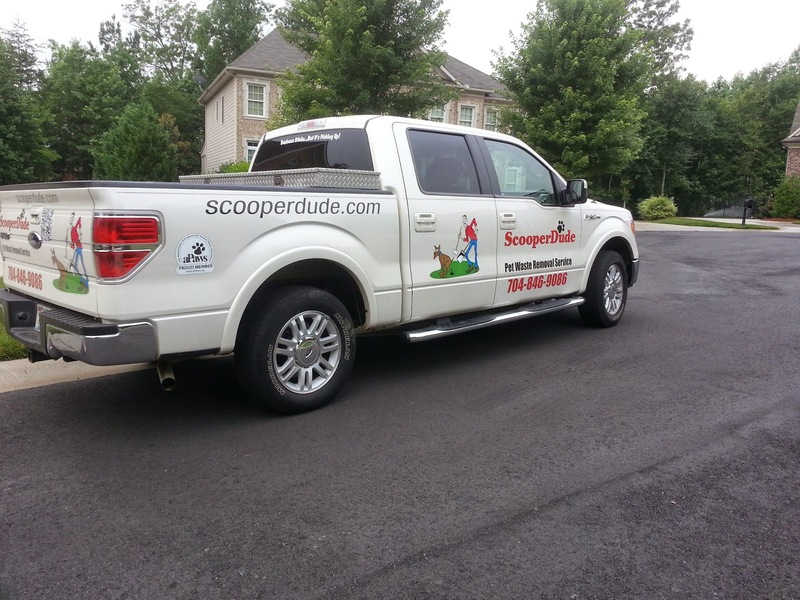 As I was walking back to the house I saw a truck that said ScooperDude. I moved closer to check this out. It was a dog service to collect poop in your yard. I stopped and talked to the guy and he said he has a thriving business because people do not want to pick up their dogs poop. That is just lazy. Why have a dog??? We decided to go downtown again to see more museums. At the corner street we see the odd sculpture. 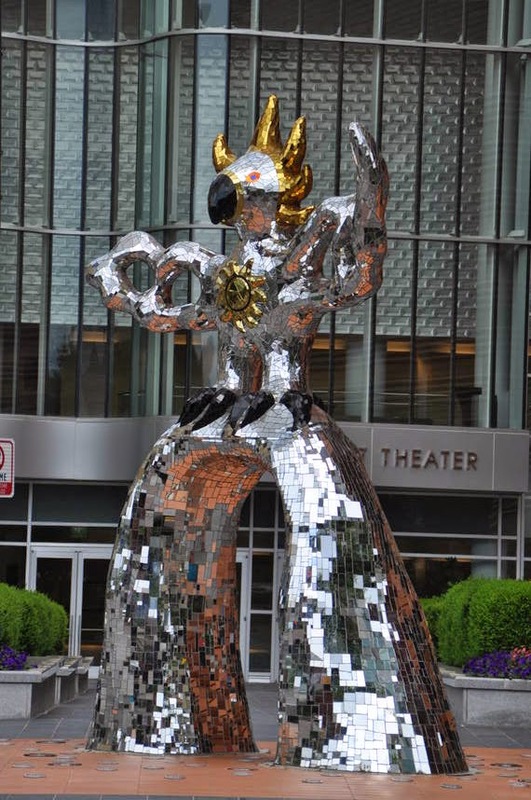 No one seems to knows what it is or the name of it, but it is part of the Bechtler Museum of Modern Art. The Gantt African American Museum was closed.. So we decided to just stroll downtown. Of course we found the Information Center. It was a delight talking with the hostess. She was a wealth of knowledge. 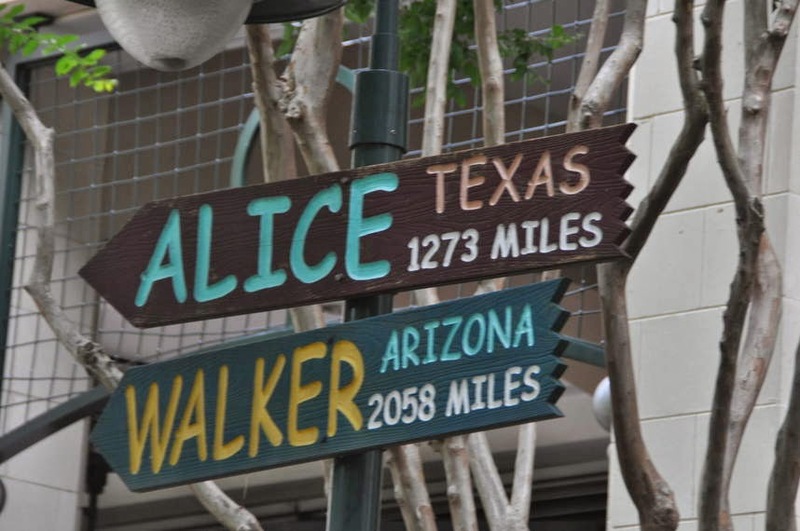 She told us about a the Wells Fargo museum and a unique museum about African-Americans in the south. 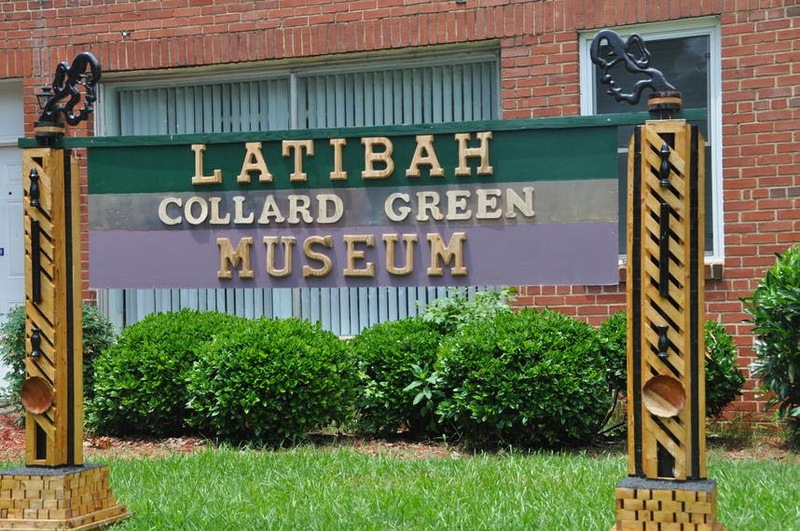 It is called Latibah Collard Green Museum. We decided to hit the Wells Fargo museum first since it was across the street. 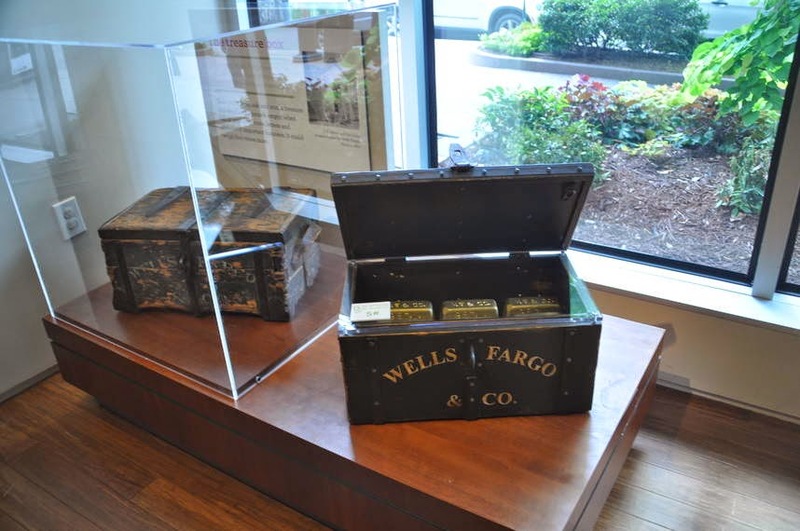 Did you know that there was a Mr. Wells & Mr. Fargo? I never put those together as someones real name. I thought it was just a company. In 1850 Wells had a express mail company called Wells & Co, Fargo had a company called Livingston & Fargo & Co. and John Warren Butterfield had a company called Butterfield, Wasson & Co. The three merged and became American Express. Am Ex to us today. 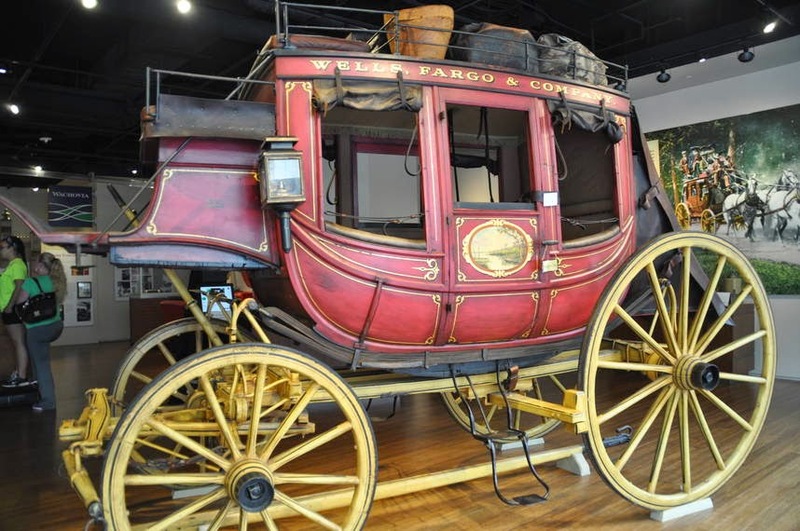 In 1852 Wells & Fargo wanted to expand to California but the Butterfield and company directors objected. So Wells & Fargo decided to expand any way and started the company Wells & Fargo & Co. They still remained a vital part of AM EX. The company offered banking (buying gold, selling paper bank drafts which were as good as gold. ), and express - rapid delivery of the gold and anything else of value. The company opened up for business in San Francisco, since it was the gold rush port. New cities wanted the company to be set up near the mining towns. WF earned a rep of trust by always dealing fast and responsible with people's money. 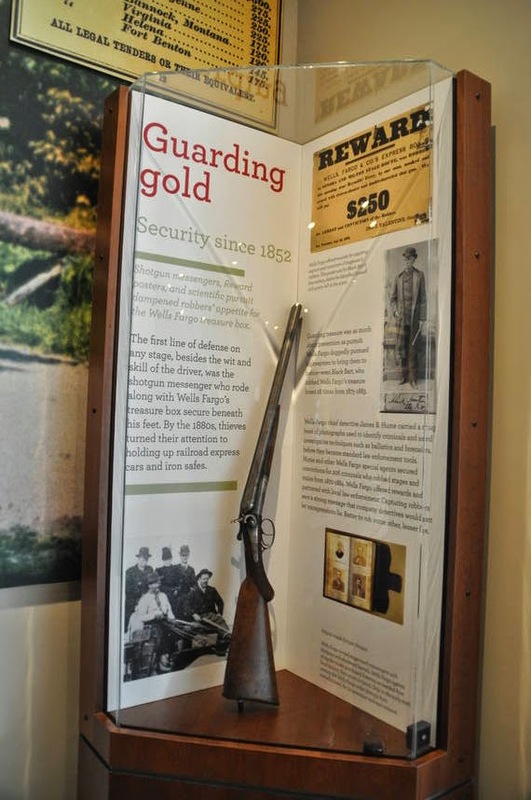 The WF treasure box rode in the front boot of the coach protected by the shotgun messenger. Can you believe that box when empty weighted 24 lbs. When it was full of gold dust, coins, letters etc, it weight 4 times more. No wonder those stage coach robbers always had two people lift that box. OK. I admit it again I saw to many westerns as a kid. 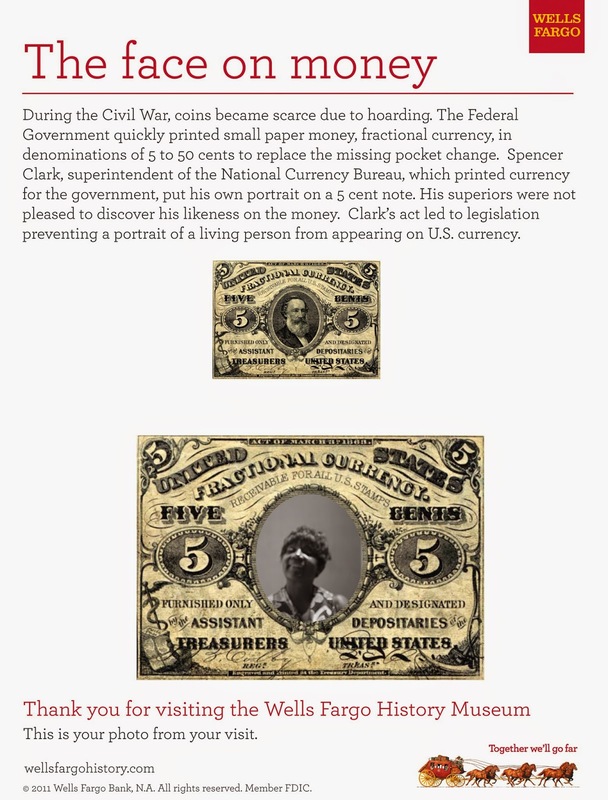 Ø First Superintendent of National Currency Bureau, Spencer Clark, without permission from his superiors, put his portrait on the 5 cent note. This act led to legislation preventing a portrait of a living person from appearing on U.S. currency. Ø WF stayed open during the 1906 San Francisco Earthquake. They just moved the bank to a higher location and rebuilt the bank. Their vault survived the quake. 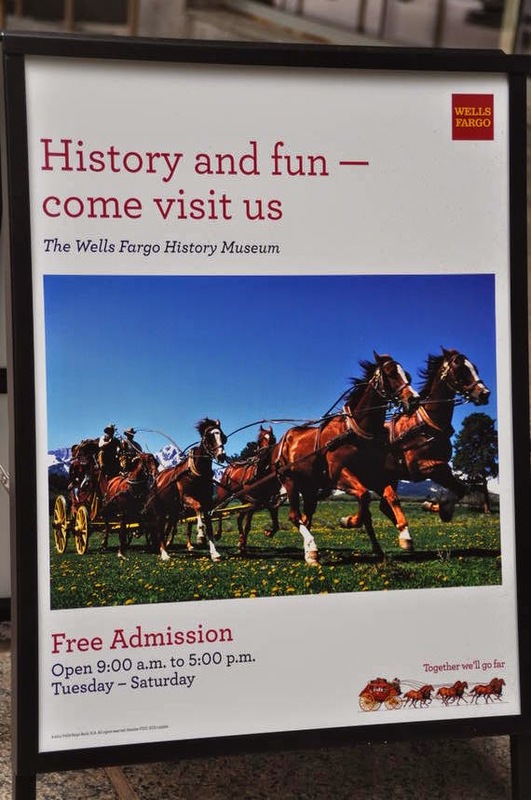 Wells Fargo prides themselves on keeping up with the times. So they moved where ever the people go. Cities, suburbia etc. We left the museum and continued on our downtown tour. 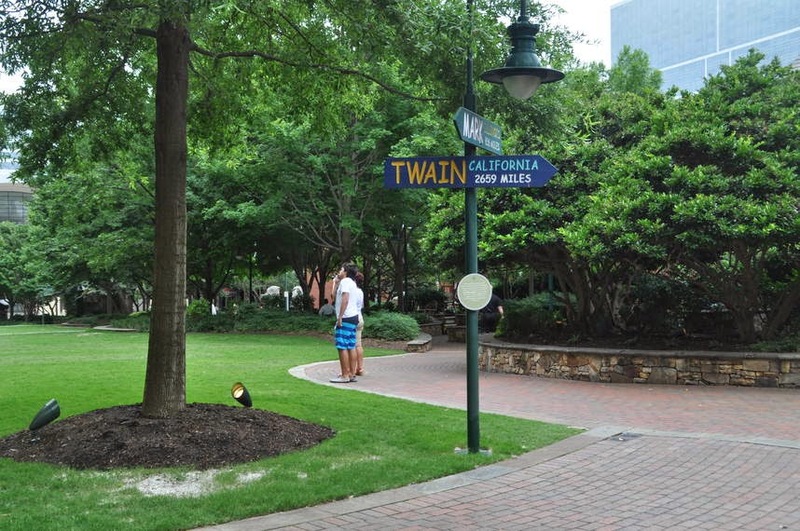 We came across the cutest park. It was based on books and authors. I immediately thought about our daughter Sharelle Brandy Dalida, (who made Teacher of the Year in her district!! OK we are proud parents. Just saying!) our Godchildren Tanita & David and all the teachers we know who love books and pay it forward my teaching our children. (If you have not read Tanita Davis books please go to Amazon and purchase them. She is an award winning author. Ok, Ok enough bragging about family). 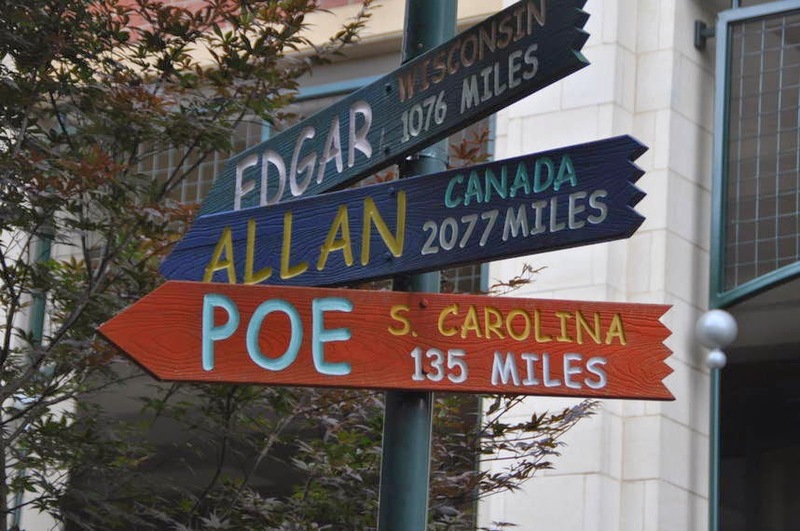 It took me a second to get the understanding that they took the name of the author, found a town and stated how far it was from Charlotte. This is a cute idea. Talk about love. 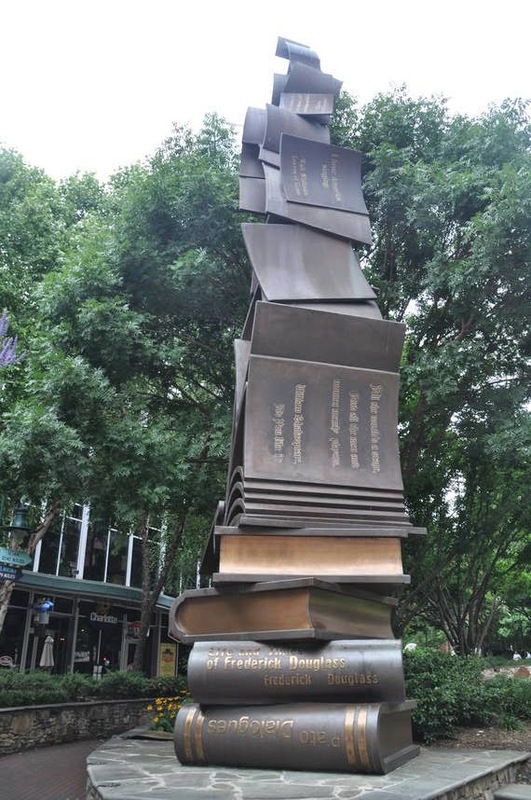 My honey knows how much I love books so he said take as much time as I wanted to in this park and he went to put more money in the parking meter. That made my day. We drove over to the next museum. It was called the Latibah Collard Green. It is an African American Museum. It was very small but the owner has done a lot of research and study on the culture. Why we were awaiting him to finish up on a tour he was giving, we met Ed Harris who is a master picture framer. He was very informative. He told us about conservation framing, which is the best. This is when you take a old picture and restore it back to the original colors and framing. He is also the framer for the Carolina Panthers. In his workshop he was doing a project of removing all the old team members that were just traded and putting in the new guys. We told him we were 49er fans. He said we had a good team. He asked if he could give us a picture of the current quarterback of the Panthers. Heck yeah. Go that puppy with us. Oh yeah! Did you know that you should never put cardboard on the back of a picture? It contains acid and it breaks down the picture. Ø Folk artist are self taught and use natural items. Ø Blacks controlled country before European conquered and changed how things were done. Ø Many slaves were from royalty and educated. Ø Slaves were taken and put in a dungeon. Ø Most were taken through the "Door of No Return" and never saw their country again. 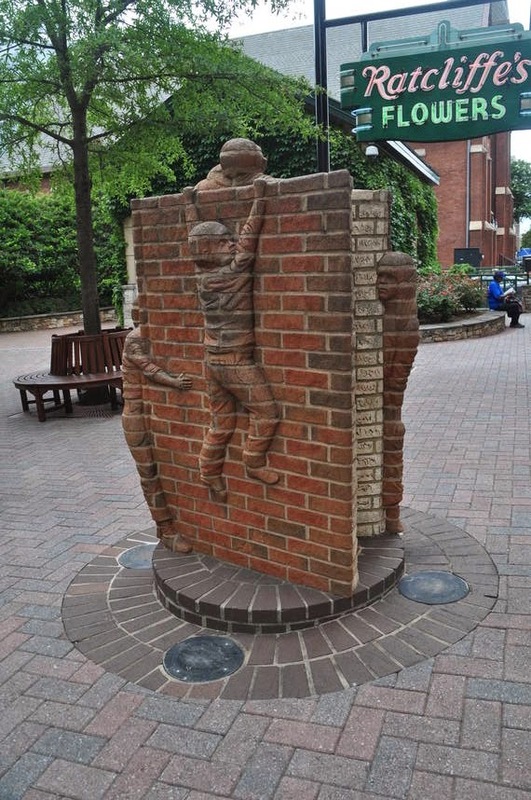 Ø Every government was involved in the slave trade. Ø Original idea of slavery was the indenture servant. This changed when the owners kept adding more time to the servant for food, housing, etc. Ø In 1630 chattel servitude was started. Ø The state of Maryland was the first slave state. Ø The Middle Passage (also known as Shark Alley) was midway to the America. Sharks would follow the boats because of dead bodies being sent overboard. Ø Dysentery was main disease. Ø 18" as all the space each slave had. Some of the items and facts were similar to what we saw in the Museum of the South. 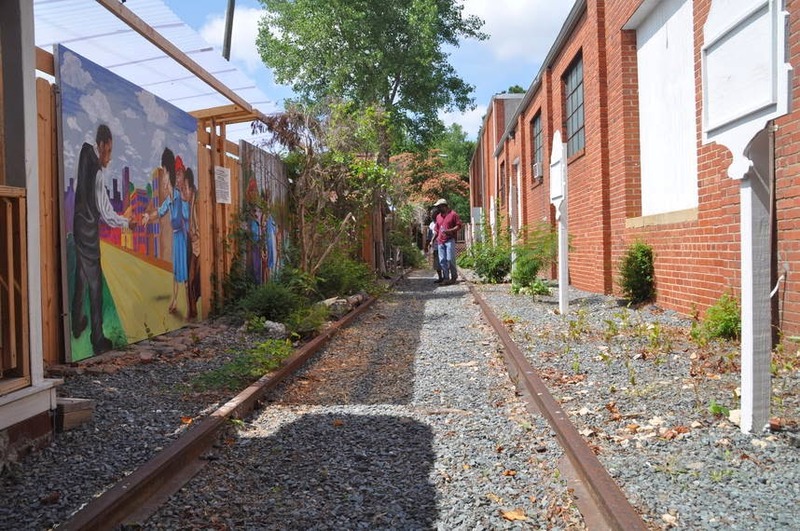 They had an outside area dedicated to the Underground Railroad. Did you know that the little Jockey man holding a lantern that was in from of a home told a story. 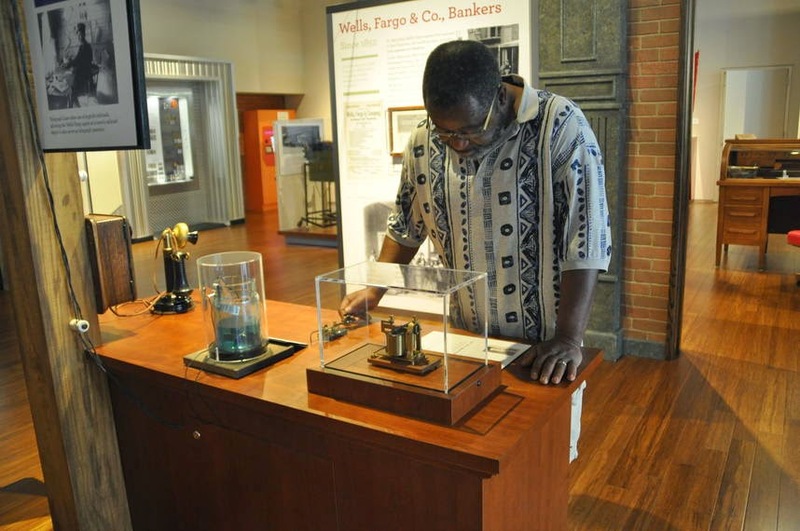 If the lantern was lit it told the runaway slave that this was a safe place to stop. Some homes had a certain pattern quilt on the fence that also told the slaves if it was safe or to keep going. Most people who have been to our home have seen the Underground Railroad quilt made for me by my wonderful YaYa sister Mary Ann Lindbloom. Thanks MAL. I treasure this quilt and will pass it on to my grandchildren. Mr. T'Afo was a wealth of knowledge. 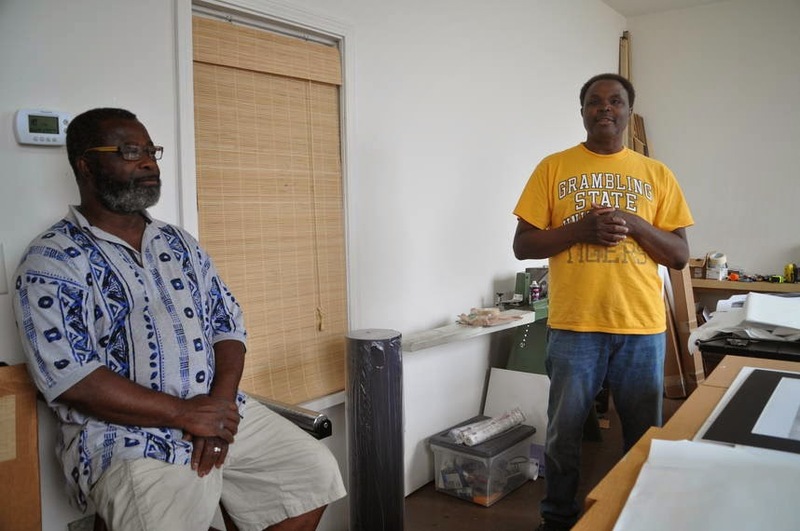 He has design the museum to used as a learning tool for the community. When you are educated you grow. We went back to the Lester's and fixed them dinner and had a good discussion of the things we learned that day. You wouldn't have gotten me out of there. I LOVE stuff like that.